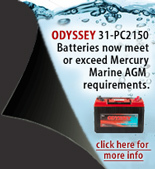 ODYSSEY Batteries now meet or exceed the AGM battery specifications required by Mercury Marine for use with their Verado L4 and L6 outboard engines. ODYSSEY Group 31 models 31-PC2150S and 31M-PC2150S exceed the reserve capacity, marine cranking amps and cold cranking amps required by their Verado outboards. Odyssey Trolling Thunder Marine Dual Purpose battery has both massive starting power and amazing deep cycling capability — up to 400 cycles at 80% depth of discharge. With twice the overall power and three times the life of conventional marine batteries, the ODYSSEY battery is ideal for trolling, starting, and for powering the many on-board electronic accessories common in today’s boats and recreational vehicles.